The removal of Activision's Crash Bandicoot site earlier today and a series of Tweets have people wondering if Sony's prodigal marsupial has returned home. Long-time PlayStation fans undoubtedly remember Crash Bandicoot, Sony's answer to Mario and Sonic in the days of the PS1, Sega Saturn and Nintendo 64. Three well-regarded platformers, plus the solid kart-racer Crash Team Racing, were developed by Naughty Dog for the PS1 and Sony Computer Entertainment, before the Crash license ultimately changed hands. 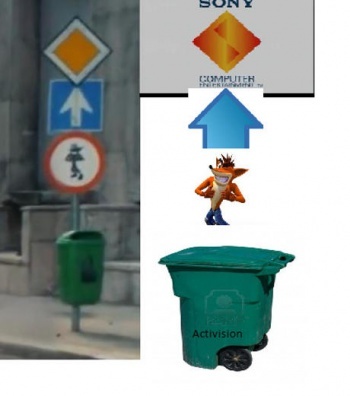 Since then, Crash has been seen on multiple platforms in several games, last seen in 2008's Crash: Mind Over Mutant, released on the Wii, PlayStation 2 and Xbox 360. However, he's never been able to recapture the popularity he had as a PlayStation exclusive. Well, if the latest morsel from the rumor mill is any indication, those days may be returning sooner than you think. Today, Reddit reported that Activision, the current license holder of Crash Bandicoot, took down their website for the series earlier today. In covering this story, CVG also reported an Easter Egg in a PlayStation 4 launch trailer, shown at the right, that seems to indicate the return of Crash to Sony's fold. CVG also reported on juicy tidbits from Twitter, where a Sony official stated that Activision still owns the Crash IP. However, a Tweet from an editor at VideoGamer said that he recieved a "no comment" when he asked Activision if they still held the Crash license. Just to emphasize, all of this is pure guesswork without an official word from Sony or Activision. However, it would certainly explain what Naughty Dog's unannounced PS4 debut title is. So, is Crash finally back in the hands of his original creators? Only time will tell. In the meantime, speculate away!